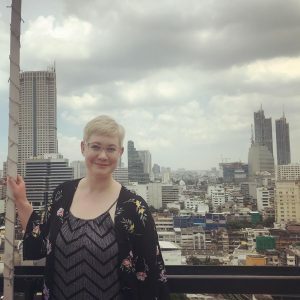 It’s hard to believe that I’ve been in Thailand for less than one week. We arrived in Bangkok at 5:30 a.m. local time on Tuesday, May 15, 2018. Immediately, we went to our hotel to freshen up and explore a bit. The afternoon consisted of a Child Safe workshop that engaged our group in a nuanced conversation surrounding the implications of child trafficking, tourism, and volunteering in Thailand. View of the Bangkok skyline from the hotel rooftop. The next morning, we got breakfast at the hotel’s buffet and headed to the airport for a quick, domestic flight to Chiang Mai. Once in Chiang Mai, we got situated at our new hotel and went to check out our local neighborhood. Chiang Mai, while the second largest city in Thailand, is much smaller than Bangkok. Chiang Mai has a lot of natural beauty and is surrounded by the mountains. It is absolutely breathtaking. That night, we headed to the Old Chiangmai Cultural Center for a traditional Khan Toke dinner and Thai dances from many of the regions. We sat cross-legged on the ground and were served family-style. The food was delicious and the dances were incredibly graceful. 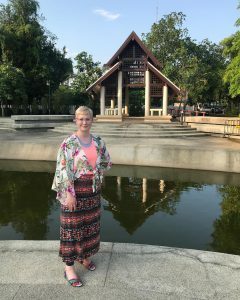 A park in Chiang Mai. On Thursday, we set off as a group to a local, community market. There, we were met by the owner of the Cooking@Home cooking school. He showed us around the market and pointed out some of the ingredients we would be cooking with that day. I decided this was the perfect opportunity for me to buy and try some durian (I liked it!). Next, we all climbed back into the van and headed to the cooking school on the outskirts of Chiang Mai. There, we watched the cooks prepare a dish from scratch, tasted from their plate, and then made our own individual portion. 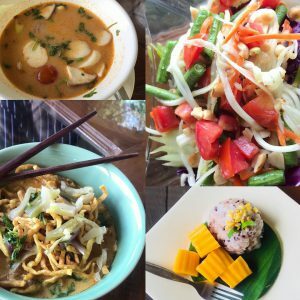 We made dtom yum goong soup, som dtam malagor green papaya salad, khaow neow mamuang sticky rice with mango, and khao soi noodle curry from Northern Thailand. It was all fantastic! Cooking@Home cooking school four-course meal. 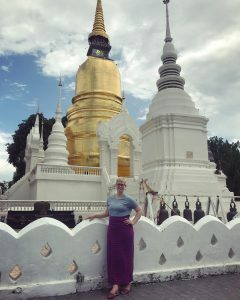 After we left the cooking school, feeling very full, we drove to the temple, Wat Suan Dok, in Chiang Mai. This Buddhist temple was built on an old flower garden, which gives it its name of the flower garden temple. Wat Suan Dok housed a relic from the Buddha, his shoulder bone. The story says that the Buddha’s shoulder bone was brought to the temple, but on the journey, it was split in two. Once it arrived, one half rested at Wat Suan Dok, while the other was then attached to a white elephant. Wherever the elephant died that was where that half of the relic would stay. The white elephant walked up the neighboring mountain and passed away at the top. At this location, Wat Phra That Doi Sutep was built and it then housed the second half of the Buddha’s shoulder bone. Inside, the temple’s ceilings are incredibly high. The beautiful mosaics and gold leaf that decorate the walls make for an impressive sight. One of our guides explained the significance of the Wat and demonstrated how to properly pray in the temple. Heads are considered the highest part of the body, while feet are the lowest. It is important that feet are never higher than the rest of your body or pointed toward a Buddha. After a tour of Wat Suan Dok, we went over to the Chiang Mai university-sponsored Monk Chat with Phra Kae Kae. He discussed with us the main tenets of Buddhism, his life story, and ways to follow the middle path through moderation in all things. His one main takeaway for us all? Balance your life. Wat Suan Dok in Chiang Mai.